You are either familiar with Rapsody because of her work with Kooley High, her solo projects or a combination of both. Either way, there is one constant that goes with the North Carolina MC: she always brings it. This is most definitely true of her recent EP, Beauty and the Beast. Without guest appearances, Rapsody delves into more serious topics, but also reminds us that she can rap for the sake of rapping. With production from Khrysis, Eric G, Nottz and 9th Wonder, Beauty and the Beast hits heavy and sets up Rapsody to do what she does best. The first track, “Feel It,” moves slow with crescendoing horns and bass kicks that are full of syncopation. Here, Rapsody’s wordplay moves from one boastful example of her skills to the next. It is, however, in good taste. “Leaders lead/ Followers trail/ I never looked back/ When you this good, you never get lapped/ Widen the gap like plus-size way in the back/ I’m too big for your britches/ Ain’t never been slapped.” Later on in the project, 9th Wonder’s fly beat on “Godzilla” lends itself to more of Rapsody’s braggadocious rhymes. It just sounds like Rapsody had a blast rapping over the beat, making it even more fun to nod your head to. While Rapsody shows us she can boast with the best of them, other tracks demonstrate how she makes sense of the world around her. “Hard To Choose” finds Rapsody speaking on the difficulty of making decisions. Over soulful production, she emphasizes that who she is, where her career has gone and what she raps about, is a result of her choices. “No love lost for whites, Latinos or the Asians/ Loyal to all, but when I look at these black girl’s faces/ I understand why I chose to be better, not basic.” The last track, “Forgive Me,” is a much-needed, high-voltage close to the project. 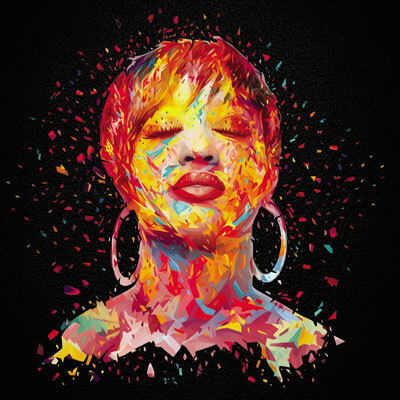 Complete with never-ending drum fills and soaring piano chords, Rapsody is at her best. With multiple references to the death of Michael Brown, racism in America, on-point social commentary and moments of witty boastfulness, Rapsody’s Beauty and the Beast is an EP worth everyone’s time. In more ways than one, the project is a representation of what life should be. There is time to have fun and chill, but it must be supplemented with an ability to think critically about what is happening in the world. Beauty and the Beast is a collection of hard-hitting beats that showcases Rapsody’s wide-range of talents. Turn it all the way up.